As a parent, you know that kids’ health issues can arise at anytime – evenings, weekends, when you’re traveling or when your doctor’s office is closed. 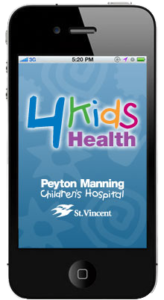 Now there’s a way to get the advice you need whenever and wherever you need it with 4Kids Health, a free new iPhone and Android app from Peyton Manning Children’s Hospital at St.Vincent. 4Kids Health helps you determine whether your child needs immediate medical attention based on his or her symptoms. It also provides advice on how to provide speedy relief for minor illnesses or injuries at home, and directs you to the nearest emergency department or urgent care center wherever you are. See how 4Kids Health makes it easy to find answers to your kids’ health questions. Look up your child’s symptoms for care advice. CPR instructions, common medication dosage tables, and first aid care instructions for children and adults. Use the app to connect directly to 911, your child’s doctor or a nearby emergency department. Provides medication dosage tables by child’s weight and age for common over-the-counter medications. Click here to download the 4Kids Health app for your Android. 4Kids Health app for your iPhone. 4Kids Health is an addition to the great services of 338-KIDS and KidsHealthLine.com – and another reason Peyton Manning Children’s Hospital at St.Vincent is your best local resource for children’s health information. The information provided with this Application is not a substitute for professional medical or behavioral advice, diagnosis or treatment; it is for informational purposes only. Talk with your healthcare provider about any questions you may have regarding a medical condition. If you think your child may have a medical emergency, call the doctor or 911 immediately. Before using 4Kids Health, all users should read and agree with the full Disclaimer available in the application within More > Terms and Conditions.